The news of the passing of Ian Fraser Kilmister, Lemmy, hit me as hard as his pulverizing yet melodic bass solo on “Stay Clean” – the Motörhead track that has fueled my final kick during many a road race. On the eve of New Year’s Eve, bearing the news of this loss in a year full of it, including childhood role model, Leonard Nimoy, my own friends, John Mutone and Ketan Ben Caesar, and extended family, my uncle Andrew Amici and grandmother Marie Amici, there was only one thing I could do to find peace. British angler Dominic Garnett helped to point the way. I have just received his new book of stories, Crooked Lines, in the mail and a recent post on his blog of the same name describes “Casting into the Wind” along gray canals lined by dry, tan reeds. That angling image offered me some light. I decided to repeat last year’s example with a visit to Prospect Park Lake in Brooklyn. 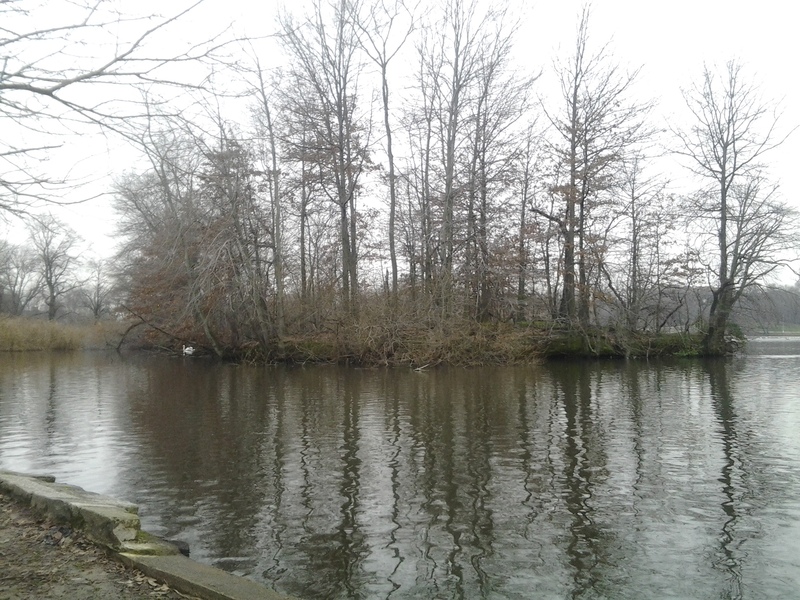 Unlike the bright and blue day I enjoyed at the close of 2014, the weather this time was gray, cold, with a hanging damp in the air. The lake sat gray and calm, the surrounding woods brown and still. The light tan of the shoreline reeds offered the only warm color to the scene, which was quiet but for the bird song of coots, geese, ducks, and gulls. 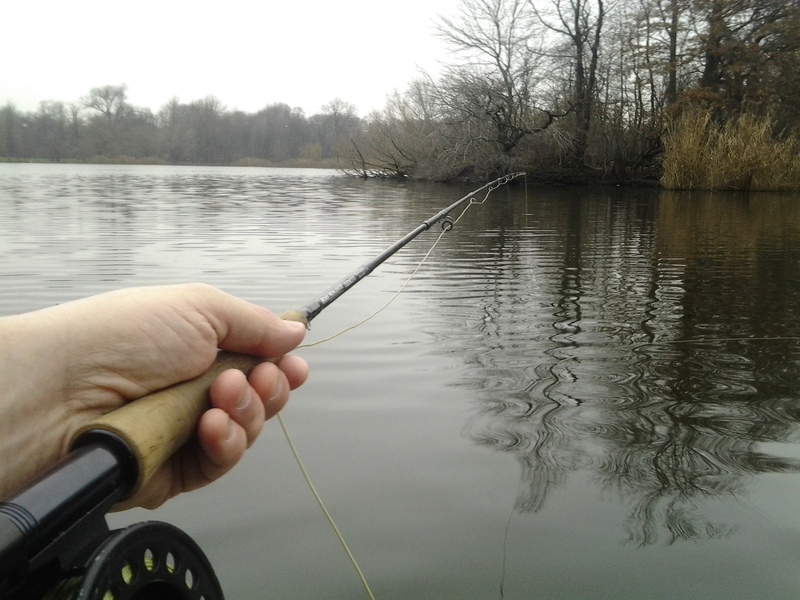 With the theme of “Letting Go” floating in mind, the decision seemed natural for me to also relax the rigidity in my fishing approach by bringing along a conventional nine-foot 5-weight matched with a floating line. The idea was to compare and contrast the equipment with my Ebisu tenkara rod with traditional furled line to learn how my casting (and hopefully, catching) may have evolved after four years spent focused on stillwater tenkara. The lesson learned to my experience is I now cast rod and line better. I find myself entering into that easy rhythm of The Zone much more easily than before tenkara came to my attention. I fished the 5-weight in a fixed line manner, lifting line and leader off the water with very little use of the reel or stripping in of line. Slow swimming lifts were used to bring my size 8 Green Guarantee home to the bank. Conventional 5-weight for comparative fly fishing. Fishing? Yes. Fish? I missed one light tug on the Ebisu. I switched to another section of the lake where I brought the 5-weight into action. Like last year, during the last hour of light, a connection was at last made. Not a perch, not like last year. 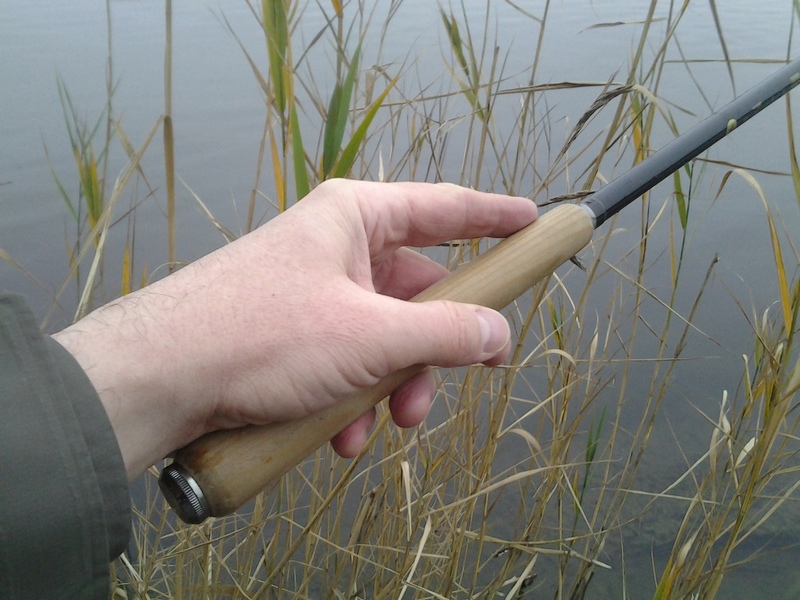 This time something intercepted the fly along the far edge of some reeds where a few sunken branches also projected. Slow and solid, the taker pulled in rippled descending waves of resistance. The rod bent in a deep way as the fish, a large black crappie, rolled, splashed, and at last reached the surface and the mouth of my beaten but unbroken Brodin net. 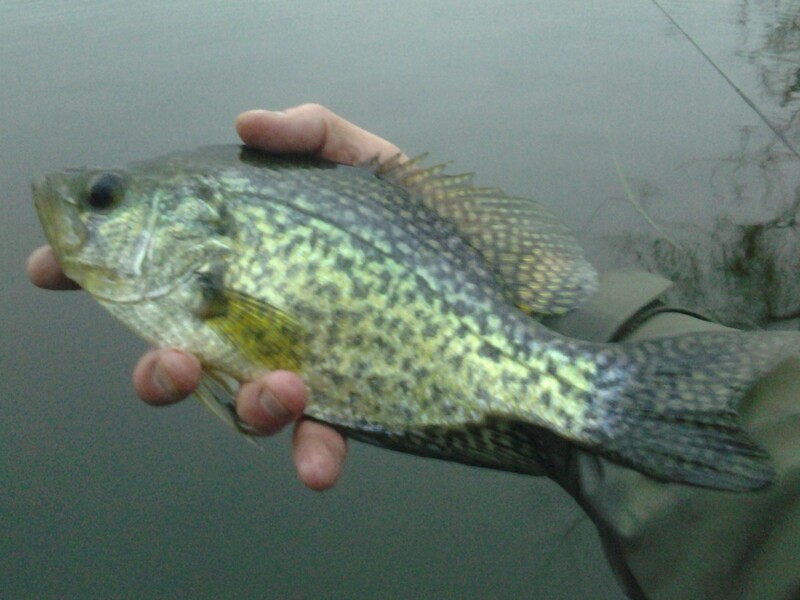 One fish, a nice one, allowed one more catch, photo, and release for 2015. Finished, the fish darted from my underwater grip. The sky had become noticeably darker. Low clouds began to roll in and my breath steamed. As I had been reminded far too many times over the course of this year, time races more than passes. “Letting Go” is necessary.